Our Funarena! : Politics: Narendra Modi Named BJP Election Campaign Chief! Politics: Narendra Modi Named BJP Election Campaign Chief! 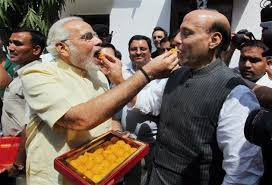 Finally the BJP national President Rajnath Singh seemed to have mastered the required support and/or dictates of the party’s top rank leaders including prominently LK Advani who absented himself from the Goa convention and the fundamentalist organizations to take the decision awaited with abated breath since the last few days. It had been a most suspenseful run-up to the announcement made in the last moments of the two-day convention in Panaji, the capital of the state of Goa. He was flanked by Arun Jaitley and Sushma Swaraj on his left and right respectively as if to render him the most needed moral support. Narendra Modi was not present in that brief news conference where Rajnath Singh just made the announcement and did not take questions from the press. Yes, Narendra Modi has been declared the Chairman of the BJP Election Campaign Committee for General Elections-2014. Celebrations started inside the venue and outside in Goa, in Gujarat and also in other parts of India as thousands of BJP workers welcomed the decision. All three BJP Chief Ministers including Manohar Parikkar of Goa too were part of the decision coming after three days of classic indecisiveness. This step is being looked as the first in clearing the way for Modi to emerge as the consensus Prime Ministerial candidate for 2014. Rajnath Singh and Arun Jaitley gave rousing speeches afterwards fully justifying the decision and the party’s faith in Narendra Modi. In his animated speech Modi magnanimously acknowledged the senior BJP leaders for grooming him for this hugely responsible post and he assured that he would leave no stone unturned in his efforts to ensure victory for his party. Of course, there had been innumerable references to the ‘non-performance’ of the ruling coalition of India in all of their speeches. Now it is up to Modi to provide a ‘performing’ alternative for the politically restive nation. Allies of the BJP led National Democratic Alliance were non-committal about the declaration. Some of them referred to it as the BJP’s internal affairs while some pointed out more directly that Modi had only been anointed Campaign Chief and not as a Prime Ministerial candidate. The Congress took potshots at the national opposition party over the apparent divide within its top brass on the decision. The party also said that the Modi appeal is only limited to his own state Gujarat and his ‘communal’ politics would go against the interests of India as a whole. The final tale on Narendra Modi would only unfold in the aftermath of 2014 General Election results. .